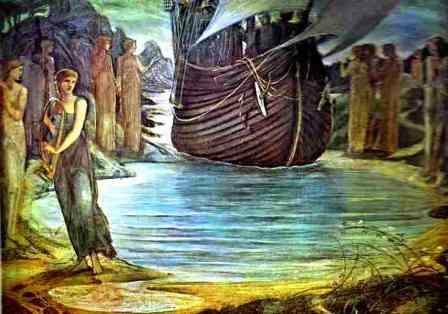 Who were the Sirens of Ancient Greek mythology? The meaning and definition of the Sirens are as follows: Definition: The ancient Greek Sirens were dangerous sea nymphs, winged maidens, supernatural beings who are described as beautiful, bewitching, enchanting and enticing. The Sirens were endowed with such wonderful voices, that their sweet songs were said to have lured mariners to their destruction. These mythical aquatic sisters are often depicted with the head and torso of a human female with large wings and occasionally the legs of a bird. Other depictions portray them as beautiful nymphs, sitting on rocks or in meadows. The Sirens were the daughters of Phocys and Ceto. 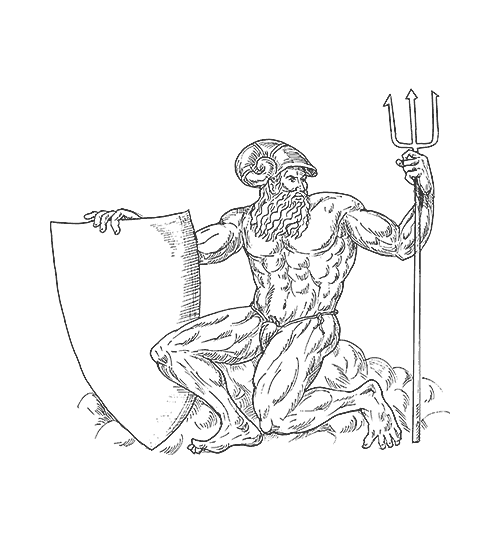 Phorcys was a primeval god of the hidden dangers of the deep and was depicted as a fish-tailed merman with crab-claw fore-legs and red-spiked skin. His consort was his sister Ceto, the primordial sea goddess, and their union produced terrible monsters such as the Echina, Ladon and the Gorgons. never again shall that man see wife or child, or have joy of his home-coming. All round where the Sirens sit are great heaps of the bones of men." The Sirens were therefore believed to be seductresses that lured sailors to their deaths. In ancient Greek mythology the story of the Odyssey is described by Homer. In the myth Odysseus is warned by the enchantress Circe that he will pass the island inhabited by the enchantresses. Circe tells Odysseus to plug his men's ears with wax so they cannot hear the songs and music of the sirens. Circe also tells Odysseus to order his crew to bind him tightly to the mast of the ship so he may listen if he wants to experience their seductive music and songs. 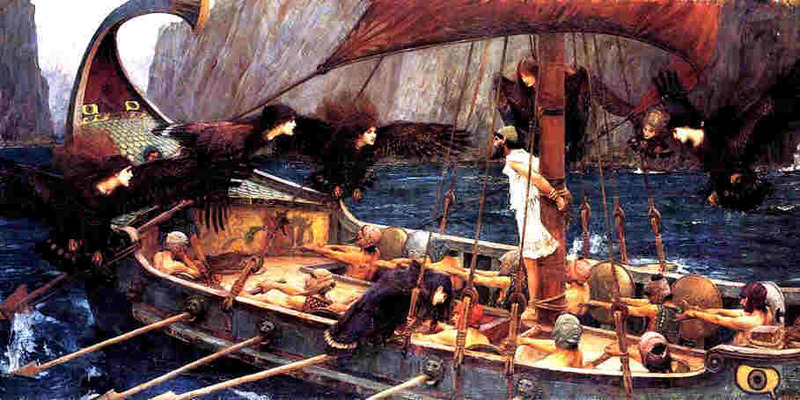 Odysseus orders his crew of sailors to plug their ears so they would not hear the Siren's fatal song (Refer to the Myth of Odysseus and the Sirens). Their voices were described as "golden-sweet above the sound of wind and wave, like drops of amber floating on the tide." A similar story involves Jason and the Argonauts and their quest for the Golden Fleece. In this myth Jason and his crew were also saved from the Sirens because they had Orpheus, who was a wondrous musician on board with them. He played music that was even more beautiful so the men hardly heard the sound of the dangerous enchantresses and were not lured to their lair. The names of the Sirens convey a picture of them using the words beautiful, persuasive, soothing and their image is compounded by descriptive terms related for their gift of enchanting music and song. According to ancient Greek mythology the Sirens were fated to die if someone heard their singing and escaped them. They sat on the shore and lured mariners with their seductive and compelling music and song. Anyone who heard their song became totally mesmerized and became obsessed with reaching the shore to get closer to the enchanting sound. And then the Sirens would eat them. In some of the legends in Greek mythology they were companions of the young Persephone and were given wings by her mother, the goddess Demeter, to search for Persephone when she was abducted by Hades. 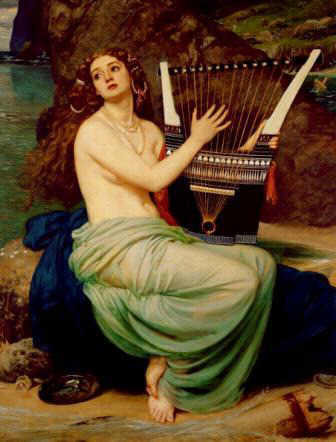 The legends of the Sirens continued with a story in which they entered a musical contest with the Muses. The songs of the Muses were loyal and true, whilst those of the Sirens were the false and deceptive strains. The Sirens were defeated by the Muses, and as a mark of humiliation, the gods of Olympus deprived them of the feathers with which their bodies were adorned. The following Sea Gods family tree illustrates the genealogy of the Sirens as detailed in ancient Greek Mythology and legends. The Sirens were the daughters of Phocys and Ceto.